I hadn't realised it was a week since I last blogged! My weekend word for the challenge is SCRAP. I sprayed the tag with Dylusions paints and then sprayed water through an alphabet stencil. I put a Timmy butterfly sticker on. Cut a circle from some patterned paper. Punched a butterfly. (such cruelty!) And put some ribbons through the hole in the tag. Then I stamped randomly. On the tag, not just my foot! 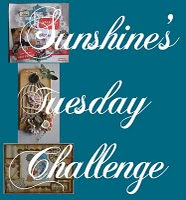 Pop over to Nicki's blog to join in with the challenge. 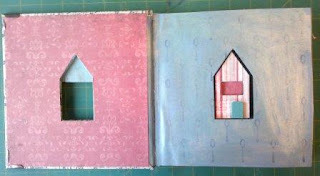 I am in the process of making an altered book. 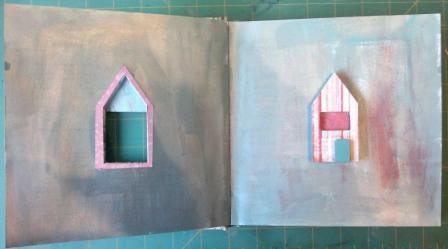 I have cut and folded all the pages inside and painted them with a coat of acrylic paint. I cut a hole in the cover of the book and stuck the roof on from a Wendy Vecchi Art Parts Residences set. 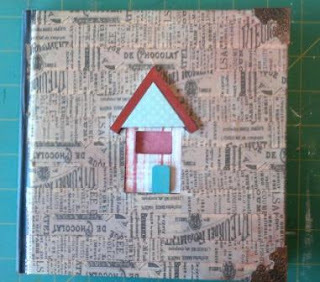 I covered the outside of the book with Tim Holtz Tissue Tape and coloured it with distress inks - although the ink doesn't show up much in the photo. And stuck the house on the next page. It is 2 layers of house thick so that when you close the book the house shows level at the front cover. The next one I do, I want to have more house on the front of the book somehow. Will have to think it through as I did some of this one in the wrong order and made it difficult for myself. I am an infrequent contributor to WOYWW but as I was actually working on something I thought I would join in today. For full details of WOYWW look here. I made 4 Artist Trading Cards (ATC) for the swap on Little Big Tree. 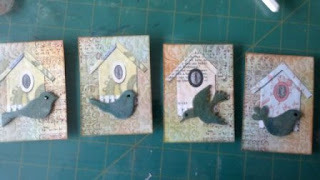 This is a new crafters forum and as I'm seeing the swap coordinator tomorrow I thought I could take them with me. I'm just waiting for the Rock Candy Distress Stickles and the Enamel Accents eye to dry on the birds. 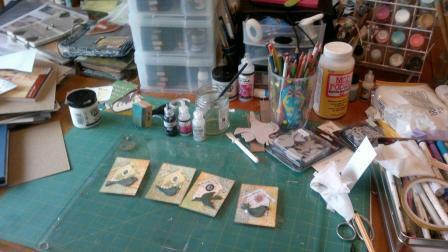 Tomorrow I'm off to Artist Trading Post to do a workshop with Anneliese. More details here. There's still a couple of places left. So hurry! 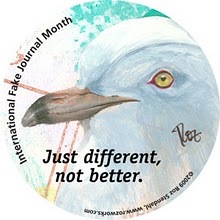 Roz Stendhal has set up this project and you can find out all about it here. I'm going to take part so drop in here.